To date, there have been a total of ten school threats in Lee County, and six have resulted in arrests. Now some parents are feeling concerned, pulling their kids out of class, just in case. Many parents have taken to social media to express their frustrations. The Lee County school district says 83,000 students are enrolled in its public schools. On February 4th, 8,300 students were absent. 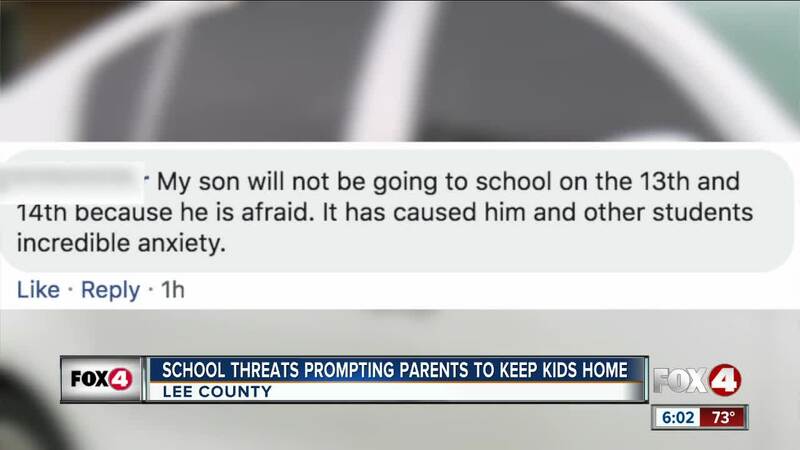 That day, 5 schools in the county received threats. North Fort Myers High had 1,200 of those absences. "It’s getting a bit out of hand. I feel like they should be doing more about it you know,” said Cape Coral Senior Tristan Cazzola. CCHS was the latest school to receive a threat. "People tend to joke about that kind of stuff, and you don’t know whether to believe it or not, it kind of scared you. Like the flip of a coin," Cazzola said. But while some parents and students aren’t taking any chances. Students like Tristan aren’t letting these threats hinder their learning. "It’s not going to hinder me at all if anything it shows that I need to be a little bit more wary of what’s going on at school,” he said.